Crystals love light. 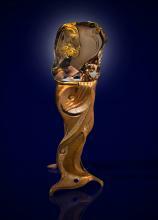 Each sculpture centers on a magnificent crystal that is artistically integrated with a bronze lighted base. The synergy of the two elements creates a harmonic resonating sculpture that transcends the visual beauty of the piece.